This documentation is for MSA-DropDownMenu version 1.0.5 and higher. And was created based on UIDropDownMenu documentation located at wow.gamepedia.com. MSA-DropDownMenu usage is almost the same as the default Blizzard UIDropDownMenu. Constants and functions are prefixed "MSA_" and was removed original prefix "UI", if it contained. Creates a dropdown menu or dropdown boxes base frame. Required - Name of the newly created frame or existing frame handle. If it is nil, no frame name is assigned. Optional - The frame object that will be used as the created Frame's parent (cannot be a string!). No value use nil for created frame. Initializes a dropdown menu attached to a specific frame. Required - Frame handle the menu will be bound to. Required - Function called when the menu is opened, responsible for adding menu buttons. Signature: (frame, level, menuList); additional global variables are used to communicate menu state. Optional - "MENU" to use context-menu style, any other value to create a dropdown list box. Optional - 2nd argument to the initialization function when called for the first time. Optional - 3rd argument to the initialization function; used by EasyMenu. Add a button to the currently open menu. Table describing the button: key/value pairs listed below. Number specifying nesting level; can typically reuse the level argument to initFunction. Opens or closes a menu; arguments marked as internal are used from within the MSA_DropDownMenu implementation to open sub-menus etc. Internal - level of the opened menu; nil for external calls. Internal - parent node value for the sub menu; nil for external calls. Both - dropdown menu frame reference (menu handle). Both - Positioning information (anchor and x,y offsets) for context menus. Internal - EasyMenu wrapper argument, passed as the third argument to the initialization function. Internal - Dropdown menu "open" button. Sets the anchor of the dropdown menu. String/Widget - Name or reference to a frame to attach the menu to. If nil, it typically defaults to the object's parent. However, if relativePoint is also not defined, relativeFrame will default to UIParent. Enables a dropdown menu that has been disabled. Disables a dropdown menu that is currently enabled. Frame handle to the menu frame. An EasyMenu helper argument that can safely be ignored. Additionally, some global variables may be useful to determine which entry's nested menu the initializer function is asked to supply. It is expected that the initialization function will create any required menu entries using MSA_DropDownMenu_AddButton when called. text String Required - Button text for this option. value Any A value tag for this option. Inherits text key if this is undefined. isTitle Boolean True if this is a title (cannot be clicked, special formatting). arg1, arg2 Any Arguments to the custom function assigned in func. hasArrow Boolean If true, this button has an arrow and opens a nested menu. icon String A texture path. The icon is scaled down and displayed to the right of the text. tCoord<side> Number SetTexCoord(tCoordLeft, tCoordRight, tCoordTop, tCoordBottom) for the icon. ALL four must be defined for this to work. isNotRadio Boolean If true, use a check mark for the tick icon instead of a circular dot. hasColorSwatch Boolean If true, this button has an attached color selector. r, g, b Numbers [0.0, 1.0] Initial color value for the color selector. colorCode String "|cffrrggbb" sequence that is prepended to info.text only if the button is enabled. swatchFunc Function Function called when the color is changed. hasOpacity Boolean If true, opacity can be customized in addition to color. opacity Number [0.0, 1.0] Initial opacity value (0 = transparent). opacityFunc Function Function called when opacity is changed. cancelFunc Function Function called when color/opacity alteration is cancelled. notClickable Boolean If true, this button cannot be clicked. noClickSound Boolean Set to 1 to suppress the sound when clicking the button. The sound only plays if .func is set. keepShownOnClick Boolean If true, the menu isn't hidden when this button is clicked. tooltipTitle String Tooltip title text. The tooltip appears when the player hovers over the button. tooltipText String Tooltip content text. tooltipOnButton Boolean Show the tooltip attached to the button instead of as a Newbie tooltip. justifyH String Horizontal text justification: "CENTER" for "CENTER", any other value or nil for "LEFT". fontObject Font Font object used to render the button's text. owner Frame Dropdown frame that "owns" the current dropdown list. padding Number Number of pixels to pad the text on the right side. menuList Table Table used to store nested menu descriptions for the EasyMenu functionality. To use the _SetSelected* functions, your dropdown menu must be the currently open / currently being initialized. Otherwise, the functions will not have the desired effect. Sets selection based on info.text values. Sets selection based on info.value values. 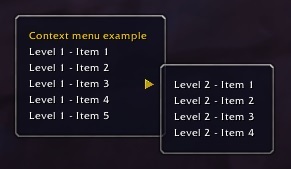 Sets selection based on button appearance order. Returns selected button's text field. Returns selected button's value field. Adjust the dropdown box button width. Alters text displayed on the dropdown box. Return text displayed on the dropdown box. Adjusts text justification on the dropdown box. Frame handle of the currently open menu. Frame handle of the menu currently initializing. Value of the parent node. Number of seconds to keep the menu visible after the cursor leaves it.